Jazz musicians, more than artists in any other genre (with the possible exception of classical music), have a transient existence. Go back and look at someone like my personal favorite jazz musician, Miles Davis, and realize that in five plus decades of making music, he was really the only constant in any of those great combos. There were plenty of comings and goings in those group. John Coltrane came and went, came back and then left again because, even as these legends played with Miles, they were also working their own projects. That’s the way it is with jazz musicians to this day, and that probably explains why fans in that genre suffer none of the angst that fans in other genres feel when, say, a Lionel Richie leaves The Commodores to embark on a solo career. Besides, an in-demand jazz musician may front or be the side man in several bands while also getting some studio work along with arranging and composing. The band Fourplay has experienced turnover since the band was formed in 1990, but the lineup has remained remarkably stable since their self-titled debut that featured El DeBarge singing “After the Dance” took the world by storm in 1991. Originals Bob James, Nathan East and Harvey Mason still man the piano, bass and drums respectively. Chuck Loeb replaced Larry Carlton, who replaced co-founder Lee Ritenour, on guitar. The quartet celebrates that stability and longevity with Silver, their 13th original record. The title pays homage to the band’s 25th – or silver – anniversary, and titles of nine of the 10 songs either include the word silver or will place the listener in a precious metal state of mine. Track eight is actually titled “Precious Metal.” Song two, “Horace” is James’ tribute to hard bop pianist Horace Silver, who died last year. Silver is not a Christmas album, but the project’s late November release is timely for a couple of reasons: First is the comfortable musical conservation that takes place between four players who bring the intimacy of friends enjoying the warmth of each other’s company on tracks such as “Mine,” where James’ piano plays a starring role. 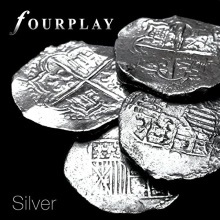 Second, reunions are a recurring holiday theme, and Silver gives Fourplay a change to bring the entire band back together on tracks such as funkily percussive “Silverado,” a track penned by Loeb and Carlton that is enlivened by their dueling guitar exchange. “Windmill” was penned by Ritenour and Mason, and showcases Ritenour’s guitar creativity on a ballad that has more than a little bit of a funky side due to East’s bass thumping and plucking and Mason’s percussion work. Every Fourplay member, whether current or an alum, has played a role in elevating the contemporary jazz game and popular music in general, and on Silver these jazz legends once again show that the whole is greater than the sum of the individual parts. This is a welcome celebration of twenty-five years of excellence. Recommended.